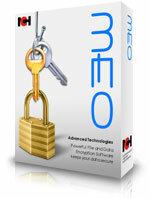 MEO is easy file encryption software for Mac or Windows that will encrypt or decrypt files of any type. Protect sensitive data against unauthorized viewers with the latest data encryption technologies to keep your important documents safe and secure. You can easily send encrypted emails, or create self-extracting encrypted files so the receiver can open the encrypted files on any Windows or Mac computer without needing to install the encryption software on their machine.